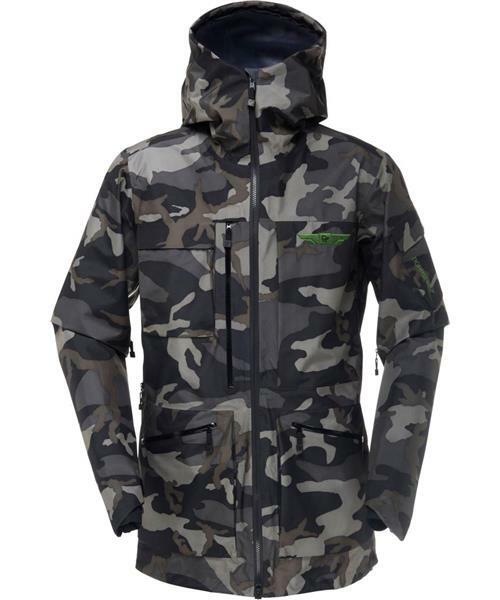 Stand-out, limited edition pattern, durable, waterproof, breathable and military inspired shell jacket made for freeride and freestyle riding in the backcountry for men. This long-cut ski and snowboard jacket will provide superior protection from rough weather on the mountain, along with great ventilation and breathability for touring and hiking missions behind enemy lines. Details include hand warming pockets, chest vent with mesh, hand gaiters, underarm vents, zip- and snap seal powder skirt system, radio/keycard pocket and a weather protecting helmet compatible hood. Made with waterproof and breathable Gore-Tex® fabric.